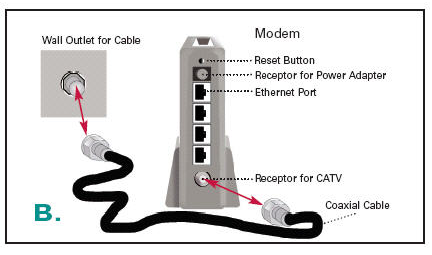 Before installing your new modem, you first need to disconnect your old modem from your cable wall outlet and computer. Connect one end of the coaxial cable to the cable wall outlet, then connect the other end to the modem. Connect the modem power cord into an electrical outlet, then connect the other end to the modem. Note: Most modems are always on and don't have a power switch. If there is a power switch on the modem, turn it on. Connect one end of one Ethernet cable into the back of the modem, then connect the other end into the Wide Area Network (WAN) port on the router. Connect the router power cord into an electrical outlet, then connect the other end to the router. Connect the second Ethernet cable into port 1 on the router, then connect the other end into the back of the computer. Check the modem and router lights to confirm they have power, and connect to the network and your computer. To learn more about which lights should be on for your specific devices, refer to the user guides.